The double soft-close bottom-mount trash can features a specialized wire management system that holds the bins securely in place. All units slide on KVs heavy-duty, full-extension ball bearing slides and Soft-Close technology. Bottom-mount units are pre-assembled for faster installation. The single soft-close bottom-mount trash can feature a specialized wire management system that holds the bins securely in place. All units slide on KV's heavy-duty, full-extension ball bearing slides and soft-close technology. Bottom-mount units are pre-assembled for faster installation. This Real Solutions by Knape & Vogt Double 27-Qt. Platinum Trash unit with Pull-Out Steel Cages features Soft Close technology. The pull-out system installs with 4 screws (included). The unit holds 2 garbage cans on a pull-out system. 22 X 11 X 18.75 In-Cabinet Double Soft-Close Bottom-Mount 27 Qt. 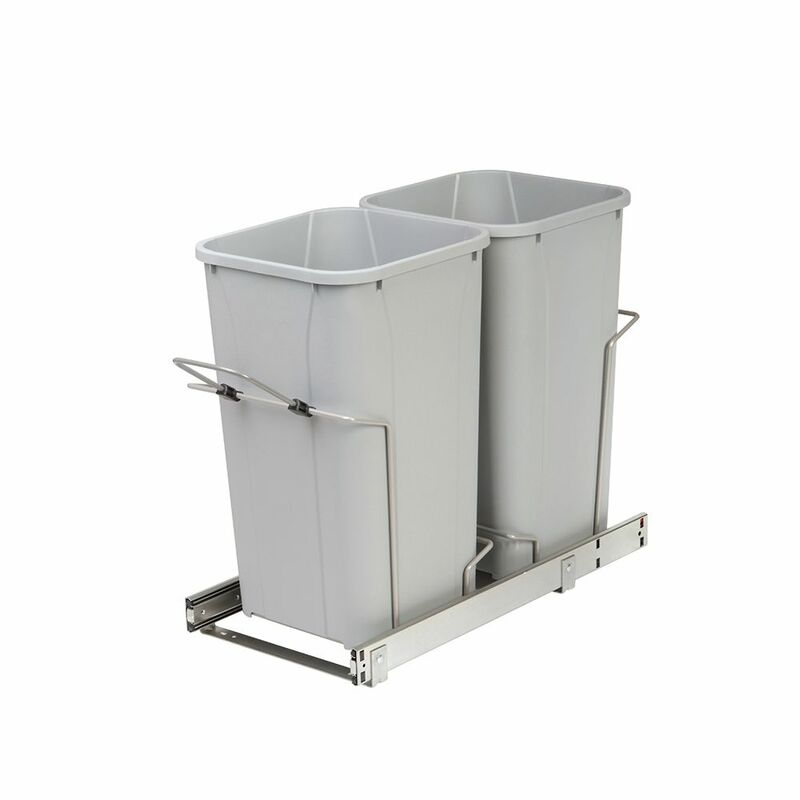 Pull-Out Trash Can The double soft-close bottom-mount trash can features a specialized wire management system that holds the bins securely in place. All units slide on KVs heavy-duty, full-extension ball bearing slides and Soft-Close technology. Bottom-mount units are pre-assembled for faster installation. 22 X 11 X 18.75 In-Cabinet Double Soft-Close Bottom-Mount 27 Qt. Pull-Out Trash Can is rated 3.5 out of 5 by 6. Rated 1 out of 5 by MGreena92 from "Easy" snap on handle doesn't stay snapped.. I bought this product today in hopes of a smooth install. the clip that holds the bin holder doesn't clip in properly, I had to kind of fake it. And after I installed the whole thing.. the handle unclips itself by the touch of a finger.. Not impressed.. This was supposed to make my life easier, not more annoying. Rated 1 out of 5 by teacher from Width incorrectly stated I asked the question about the descrpency between the stated width in the title 14.375 vs the specs 11.25. The answer was it is 14.375 and they will change it in the specs in the future. Wrong! It is 11.25, I'll be returning this. Is it possible to have a replacement handle shipped to me? I purchased today and after install, the pull handle snaps off with the slight touch of a finger which makes the whole product hard to use. Would save me having to return product. Hi, We are so sorry to hear that you are having issues with the handle for this unit. Please contact our customer service department at customer.service@kv.com or 1.800.253.1561 and we will get you a replacement handle shipped out. Are the rails mounted directly to the base of the cabinet, if so is the length 22&quot; exactly and width 11&quot; of the rails? The exact depth of the unit is 22-1/8&quot; and the exact width is 10-31/32&quot; at the widest point, which is the head of the rivets that hold the slides to the mounting brackets.. Typically these units are mounted inside a cabinet so the cabinet door conceals the odors and visibility of the trash bin and it's contents. Some consumers feel the lid is a redundant feature. Currently we do not offer a lid for this bin. Is it possible to order just the bins? We have a pull-out system but do not have bins that fit.